On 8 February, the Ukrainian Navy Command made a statement about a media campaign under way to discredit the fleet. The Navy HQ considers it to be a "revenge to navy sailors for their loyalty to the oath". 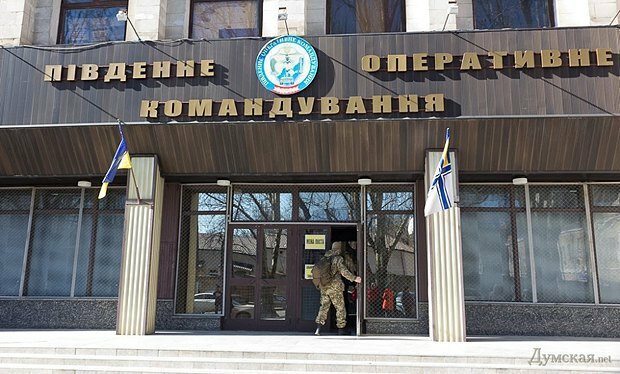 What they have been forgetting to say is that mass media raised their voice after volunteers had posted online a video of the scandalous incident which involved shooting at the naval base in Odesa, to which the command produced no reaction at all. The statement reads that the "fleet is not a closed institution" and is prepared to face constructive criticism. Nevertheless, our information inquiry, which we sent to the Navy press service back in November 2015, has not been answered yet. Therefore, unfortunately, the issue of naval reform raised in this article contains no official comment of the command. Almost a year ago, on 6 March 2015, First Deputy Defence Minister Ivan Rusnak signed a decree on preparing a pilot project on reviving and developing the Ukrainian Navy. One of two clauses of the decree reads that the project should be in line with NATO standards while its development should involve representatives of the Northwood HQ of the NATO Allied Maritime Command. In fact, this decree and the pilot project itself were "promoted" by a group of Odesa volunteers who, after six months of work, understood that patching the holes (in its direct sense) at the Navy ships which were left after Crimea's annexation [by Russia] is not the way to revive the fleet and make it battle-worthy at all. "Considering the need to restore the Ukrainian Armed Forces' Navy practically from scratch and the fact that it contains nearly all components of the Armed Forces of Ukraine, we suggest that naval reform should be implemented through the respective pilot project of reform of the Ukrainian Armed Forces' Navy and involve NATO experts," Natalya Zeynalova, a volunteer and the head of the committee for the development and revival of the Ukrainian Navy under the Association of Ukraine's Volunteers, wrote back then in a letter to the defence minister and head of the General Staff. The idea was clear and quite sensible: test the reforms on the smallest and most destroyed kind of Ukrainian troops and later extrapolate them, using the experience earned, to the entire Armed Forces. 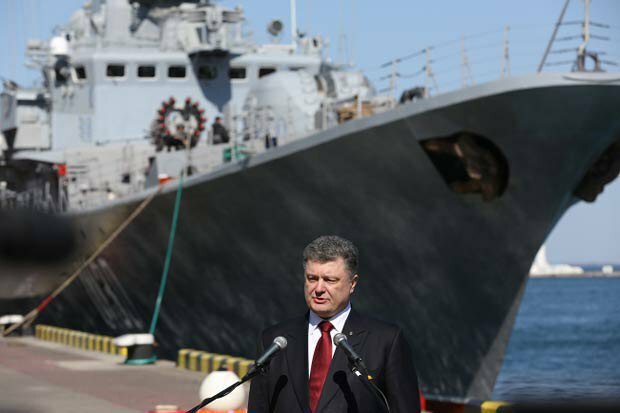 On 10 April 2015, the Ukrainian president announced the start of the pilot project to revive and advance the Ukrainian Navy in line with NATO standards on board the Hetman Sagaidachny frigate. 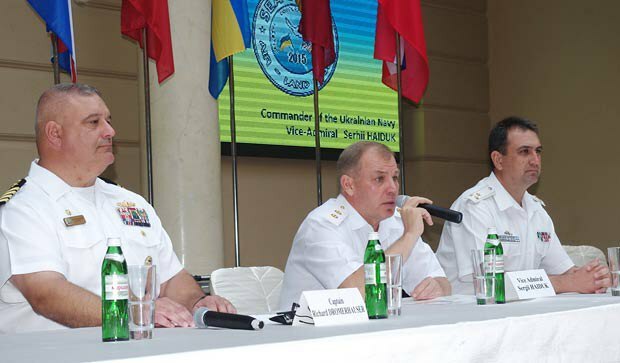 Three working meetings to develop a concept entitled "Reforms and Navy model for 2015-2020" were held in April-May 2015 and involved experts of foreign navy, NATO and the Ukrainian Navy. 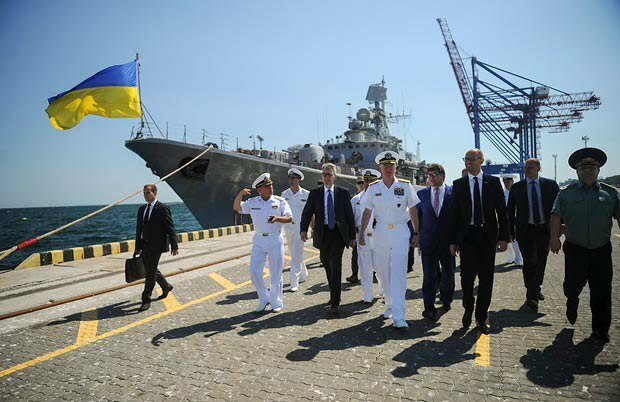 Foreign and Ukrainian experts together signed the key ideas of naval reform, which took into account external military challenges to Ukraine and its financial capacity. It would seem there was little left to do: present the document to the Ukrainian Armed Forces command and immediately start putting it into practice. But that is when the miracles start to happen – even if there are changes at the Navy, they are not about NATO. The first signs of the Navy Command's unwillingness to implement the model emerged back in the summer 2015. In June, Navy Commander Vice Admiral Serhiy Hayduk did not send a Ukrainian delegation to the Swedish Navy HQ (the visit was fully sponsored by Sweden) to put the designed model into practice. Granted, the model of the Swedish naval fleet construction was suggested by foreign experts as one of the most relevant to the Ukrainian naval reform. Simultaneously, on hayduk's instruction, officers with principled views were called off the project and it was handed over to more "obedient" ones. In July, the Defence Ministry website cheerfully reported on the visit of the assessment and advisory group from the Northwood HQ of the NATO Allied Maritime Command to the Ukrainian Navy to define the key priorities in Ukraine-NATO cooperation in developing and restoring the Navy capacity. The thing is the NATO experts never had a chance to see the real condition of the fleet. They saw a dog and pony show, a training base and, of course, they were taken to the Hetman Sagaidachny frigate. However one could clearly feel that the true "antiquities of the fleet", including Shostka [lift ship], Korets [tugboat] or Netishyn [diving boat, NATO: Yelva class], were hidden from the sight of NATO experts. One could attribute such a reserved stand to the Navy Command's addiction to Soviet show-offs and see nothing sinister about it if not for what happened next. By September, it has already been celar that the pause in implementing the designed model is not just some time taken to think and elaborate the respective concept or plan in detail. The signposts of the model were deliberately ignored while the fundamental definitions of the future reform were distorted and replaced with old Soviet practices. "Quantity" has again defeated "quality". Instead of building the Navy on the rational basis, the path of bloating the existing post-Soviet structure with unmanageable for the state costs was chosen. In October 2015, Hayduk sent his authorized representative, Rear Admiral Dmytro Taran, to Brussels where at the Ukraine-NATO consultations the latter presented the concept of the Ukrainian Navy development with regard to the model already designed with the help of foreigners. To the foreigners' great surprise, they discovered an absolutely different text under the same title. It was a fundamentally different document which had nothing to do with the version which was previously developed and agreed with an international expert group. Indignant volunteers demanded that the Defence Ministry sort the situation out, which resulted in setting up a working group consisting of experts who had developed the initial text. In the meantime, the Navy Command did its best to keep the representatives of the Navy HQ from attending this meeting even in spite of the defence ministry's direct instruction to hold it. As some in the fleet HQ said, Hayduk reprimanded naval officers for this (the reprimands were later overturned by the minister) and stripped them of their bonuses for 2015. Foreign experts were quite straightforward at this working group's meeting. They put a point-blank question: why did the Navy Command simply remove the fundamental provisions of the jointly developed document? "Why was a new 'clipped' product, which has all traces of Soviet templates, presented as a joint one?" the foreigners asked directly. They were disappointed by the fact that Commander Hayduk personally had taken part in discussions on the key principles of the model together with foreign experts. As a result, the working group insisted that the minutes of the meeting mention the same principles as in May and recommended that the Defence Ministry "use the provisions of the concept "Model of naval reform and development" as a basis for the entire Armed Forces of Ukraine". After a difficult five-hour-long discussion, one of the foreign experts made a very concise conclusion: "To implement naval reform, one needs to take and implement it. I cannot see any other problem." So what is the essence of the reform proposed by NATO experts and why the Navy Command has been avoiding it at all costs? The authors of the concept entitled "Model and reform of the Ukrainian Armed Forces' Navy", which was written as a result of the April-May meetings of the working group, pointed out that Ukraine's economic interests in the sea should be protected. Their estimates showed that five regions of Ukraine with access to the sea ensure 25 per cent of GDP. If you cut these regions from Ukraine, the country's economy will lose dozens of billions of dollars a year. The loss of control over the sea shelf with prospected natural deposits would cost Ukraine up to 1,000bn dollars, which is five to seven times the amount of its GDP. The document lists the fleet's key tasks both for short-range sea areas and for the main sea in connection with required platforms (ships, boats, aircraft) and the associated risks if these tasks are implemented not in full or cancelled altogether. There was also a so-called "wishlist" of the reform mentioning the approximate estimates of the cost of five options of a new Navy: from the current amount of funding to the "victory at sea" option. The required amount of investment into the Navy over the course of five years would vary from several million dollars (current level) to 4bn dollars. It should be noted that no key documents on the Ukrainian Navy development with associated spending forecasts existed at the time (to these days). Therefore the experts gave a ballpark figure of the "financial resource", mentioning the acceptable budgets to match various ambitions. Also, the experts suggested that the command system be radically revised to make it compatible with that of Western armed forces, primarily with regard to three tiers of the command system and two functional vertical structures. Thanks to this, the number of staffs and supply structures can be cut significantly (times) while more young officers who had naval practice should be engaged in them. Today the Ukrainian Navy has 13 admiral posts and 10 (nominal) warships and boats. 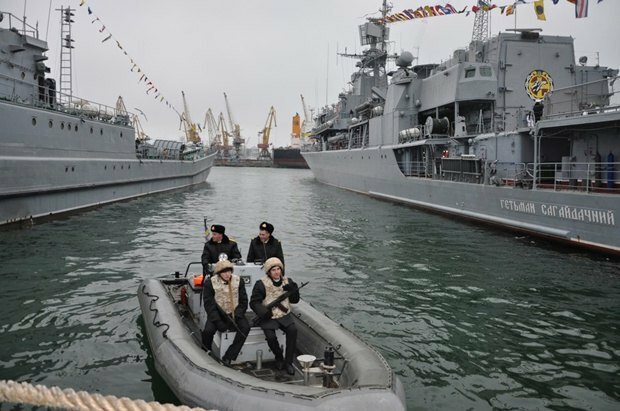 Western experts suggested that the number of admiral posts in the Ukrainian Navy could be easily cut to three or four. The same position (just like all others) are true to the entire Ukrainian Armed Forces as such. If implemented, it can unlock the allocation of 30 per cent of the military budget to the development of new weapons (as it is common in the West) but not 12 per cent as it is planned this year. 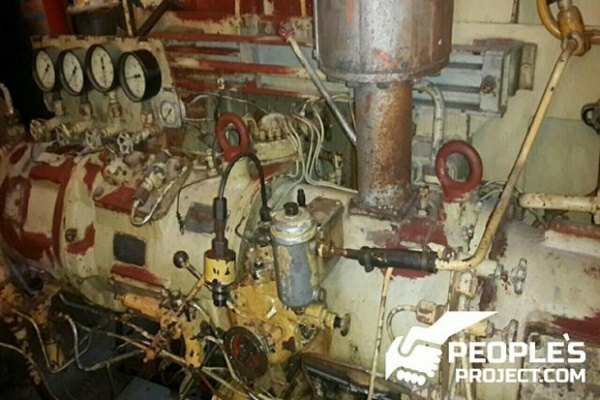 Under any conditions, the foreigners stressed, the first thing Ukraine should stop doing is to repair old ships and boats for which dozens of millions of hryvnyas are written off annually. The Ukrainian Navy Command pretends it does not hear these recommendations. Instead of urgently implementing the reform and accumulating funds to build warships, the Navy HQ makes incessant efforts to restore auxiliary vessels which are 40 or 50 years old. "Now machine guns were installed on civil ships, for example on Horlivka, so now they are armed vessels. There are certain advantages, of course, they are big, you can pile up mines and throw them around the coast. But one would not be able to make a career on Horlivka. This is not a warship," one of naval officers speaking on condition of anonymity explained to LB.ua. Another important recommendation from NATO (first made public 15 years ago) was to move the Navy Command to Kiev. The commander should be in direct contact with the Defence Ministry and the General Staff, defend the interests of the fleet and be a political figure, experts said. It is especially topical for Ukraine now when the fleet is faced with the need to build new ships and boats, a huge number of social problems caused by the pullout of troops from Crimea and the issue of replenishing material and technical resources. In the opinion of Western experts, common sense and Ukraine's limited resources demand that the Navy, the maritime units of the State Border Service, the Infrastructure Ministry and other maritime offices be integrated as close as possible to act jointly in the Black Sea and the Sea of Azov. The rational use of Ukraine's own resources will clearly work towards an increase in Western help. And vice versa. By the way, the recent case of two drilling rigs worth 1bn dolalrs being towed away from under Ukraine's "nose" near Odesa is yet another proof that this recommendation is topical, we are vulnerable in the sea and that any unwillingness to act at all, apart from simply stating the fact – "observed and made photos", is criminal. The next critical problem is that the command is overly centralized. One of the tasks of the reform is to delegate as many powers as possible to subordinate staffs and commanders. The experts are confident this will not only lessen the load on the central apparatus but will increase responsibility on all levels of command. There should also be a connection between responsibility and financial powers. According to the NATO experts, the Navy Command should directly control the funds on manning, training and maintenance and development of doctrines, and be accountable for their use. None of the clauses presented in the reform model designed together with NATO experts made its way into the "historic" document entitled "The concept of the promising model of the Ukrainian Armed Forces' Navy until 2020 (pilot project)", which was later presented by the Ukrainian Navy HQ in Brussels. Nine pages full of general phrases without any specifics and absolute disregard of the expert recommendations. "Hayduk made a forgery and was caught red-handed," volunteer Natalya Zeynalova said. "He was not punished for this at all." "The supreme commander-in-chief put a clear task to ensure that the Ukrainian Navy is revived and advanced in line with NATO standards," one of the experts of the working group said. "This task is not being implemented. In fact, the basic principles and practice of this organization spelled out in detail in a 20-page document in plain language are being sabotaged. Without implementing them, there can be no talk of moving to NATO standards at all." The next NATO summit is around the corner. How will the president feel there? How will Ukraine look in the eyes of its partner which we have been "feeding with promises" and now also lying to? Will they still be willing to help us?